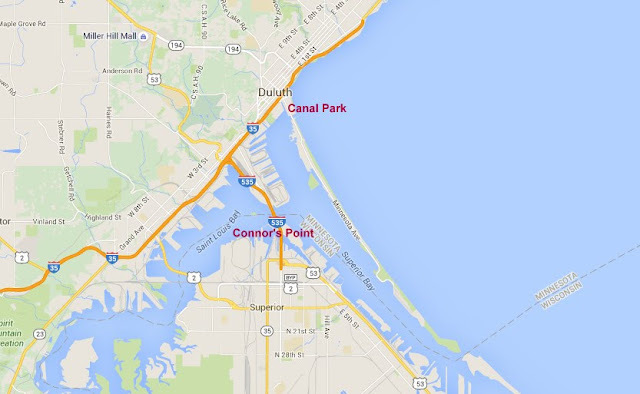 As you know, a 1st cycle Ivory Gull has been hanging out at Canal Park in Duluth, Minnesota since New Years Day. Very close by in Superior, Wisconsin, a different 1st cycle Ivory Gull was found on Tuesday evening (05 January 2015) by Bryan Murdock at Connor's Point. Same age & plumage, only the second bird was found dead. Yes, two Ivory Gulls within a couple of miles of each other. One dead. One alive. You can read Laura Erickson's detailed post on this bizarre story, here. The purpose of this post is to present a precedence that I think is noteworthy. This is now the 4th time - at least - that out of range Ivory Gulls have appeared in duos. St. Paul, Minnesota. 15-23 December 1991. Both 1st cycles. Although initially only one was being seen, and only one was thought to be present, both birds were eventually observed together. Port Washington, Wisconsin. 31 December 1997 - 03 January 1998, 1st cycle. 10-13 January 1998, adult. Many birders came up the first week to see the 1st cycle, and drove right back the next week to observe the adult. Northumberland, UK. 07 December 2013. Two 1st cycles. Initial sighting was of one bird, and then while observing this bird a second individual appeared. The three examples above weren't Ivory Gulls found a couple miles apart, they were found at the exact same site. For a gull that is supposed to be very rare away from the arctic, this pattern of duos at the same location is curious, to say the least. Does this occur more often than we know? Thanks to Paul Budde and Michael Murphy for the St. Paul and Northumberland examples, respectively. The Port Washington Ivory Gulls were both birds that my friend Andy Sigler chased, two weekends in a row. IVORY GULL (1st cycle). Duluth, MN. 02 January 2016. Thanks for sharing these, Alexandre. The trio from 2013 is extraordinary! Interestingly though, none of the birds of the trio were seen together eventhough all birds were seen roughly at the same place (plus or minus 300m). Good pictures allowed for the distinction between the 2 adults. To make the story even better, the first bird was spotted at a feeder! This, I think, is a great lesson for us. We assume only one bird would be present. I imagine a very keen eye would be needed to tell two adults apart. Great information. -- two juveniles, Hamilton Harbour (January 1-4, 1953); see "Ivory Gulls in western Lake Ontario" by Eric W. Bastin. The Wilson Bulletin 65: 207 (1953). Fantastic! Thanks for sharing this historical record, Alan.